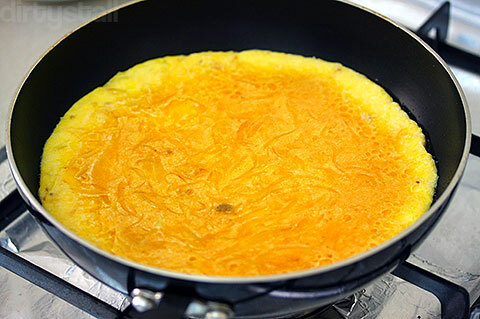 Frittatas are open-faced Italian omelettes, differing from the typical French omelette as the ingredients are mixed with the raw eggs instead of folding it around them. 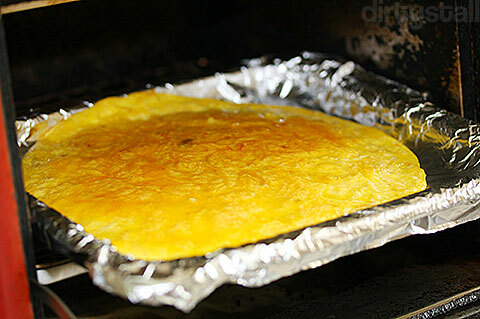 The frittata is normally first started on the stovetop and then finished inside an oven. This is the main difference from other omelettes as the frittata is always cooked slowly over low heat. For this dish, I first sauté 4 cups of sliced onions in olive oil and some salt, covering the pan on low heat. Once the onions wilt and reduce in bulk, I uncover and cook until the onions are golden-brown. Next I mixed 5 eggs with 2/3 cup of grated parmigiano-reggiano cheese, some salt and black pepper and those sautéed onions. Melt 2 tbsps of butter in a sauté pan and once it foams, turn down the heat to very low and add in the eggs. After a while, the eggs will begin to set with only the surface being runny. That’s when I shove it into an oven, set the heat to high and watch. Take it out once the face of the frittata sets! 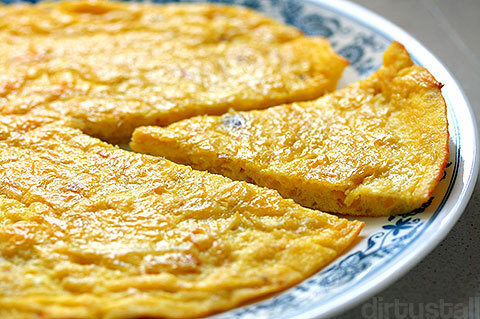 And there you go, a nice yummy frittata to share with your family! The cheese really brings out a whole new flavour together with the onions. And besides onions, you can add in just about anything as well, such as parsley, sausages, artichokes, etc etc. 2 Responses to "Frittata with onions"
Hahaha yes!! 😀 New entry!